Recently I was dealing with an annoying problem concerning a Bluetooth connectivity problem on an Imaq with the alu wireless keyboard and mouse. After setup Windows 8 with Bootcamp I was unable to connect the keyboard. Connect the BT mouse is no problem. It took me a very long time to find a solution and to get both mouse and keyboard connected to the Imac. I would like to share my thoughts on this case. Any thoughts on this subject please do share it by adding your comments down below. My experience on this connection issue is only in Windows 8; I tried connecting both mouse and keyboard in Windows 7 on the exact same Imac without any problems. Now it’s the best moment to hook up a wired USB keyboard and mouse to your Imac. Step 1. Remove connected devices in Mac OS X. 1.1 Press and hold Alt button (Option key) to boot your Imac into Mac OS X. 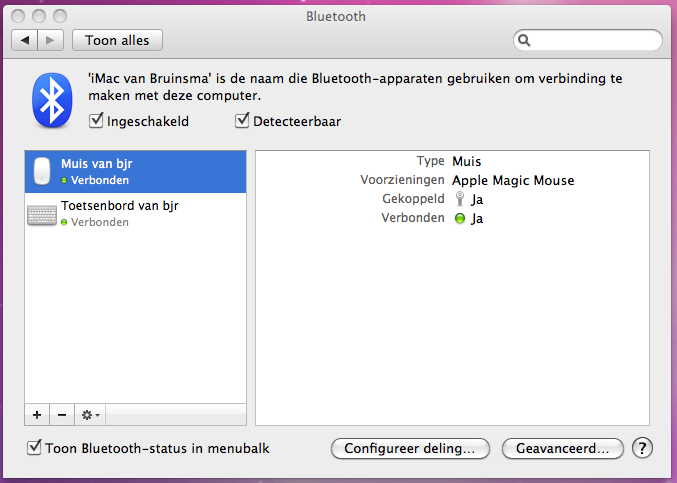 1.2 Point your mouse to the upper right corner of your screen and select ‘Open Bluetooth-voorkeuren’. 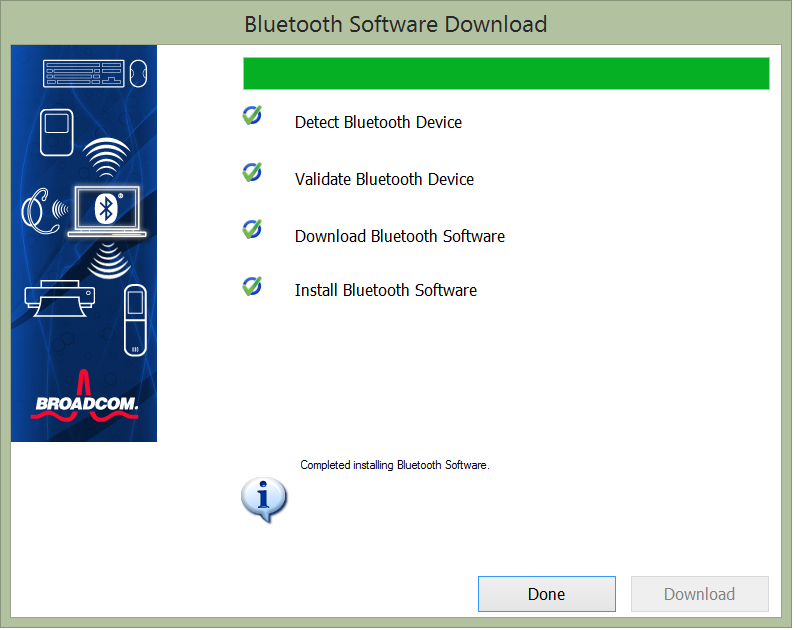 1.3 In Bluetooth menu select the Bluetooth device and press ‘ – ‘ to remove device. Repeat this step to remove all devices from the list. Step 2. 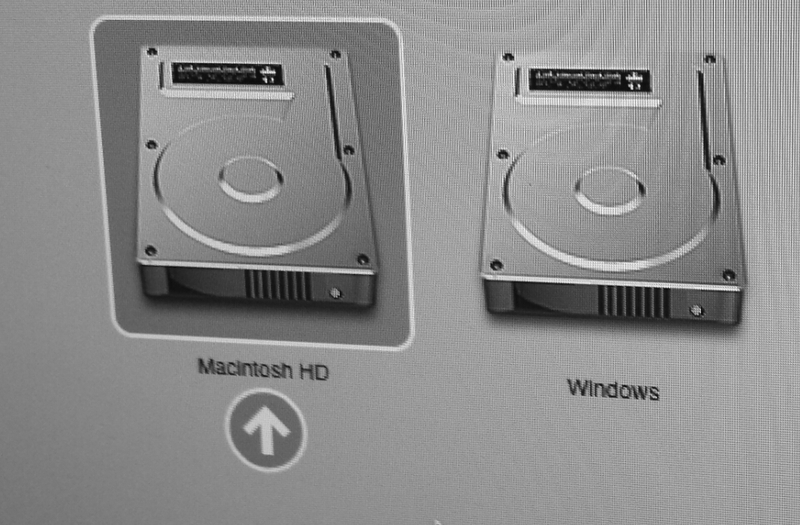 Boot your Imac into Windows and connect mouse and keyboard. After downloading setup select and run program. 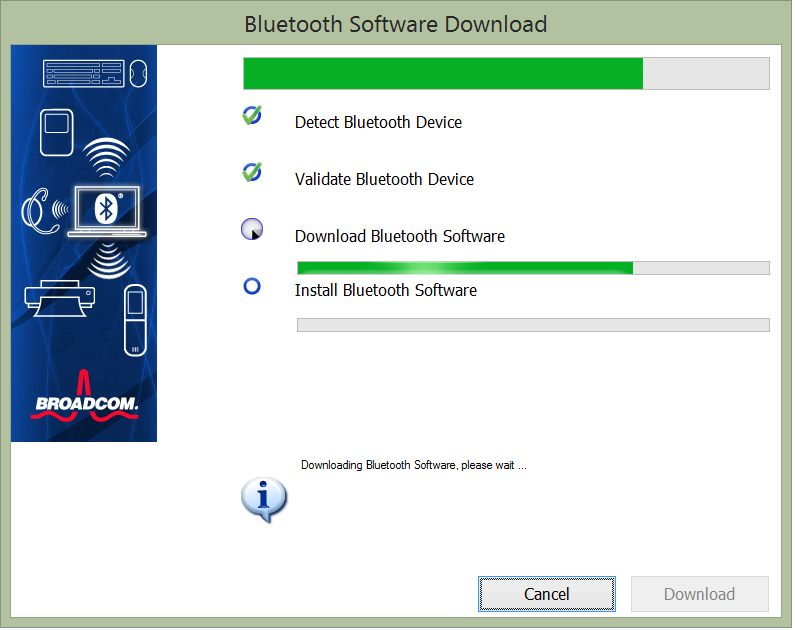 The program automatically detects your BT device and starts downloading the appropriate drivers. 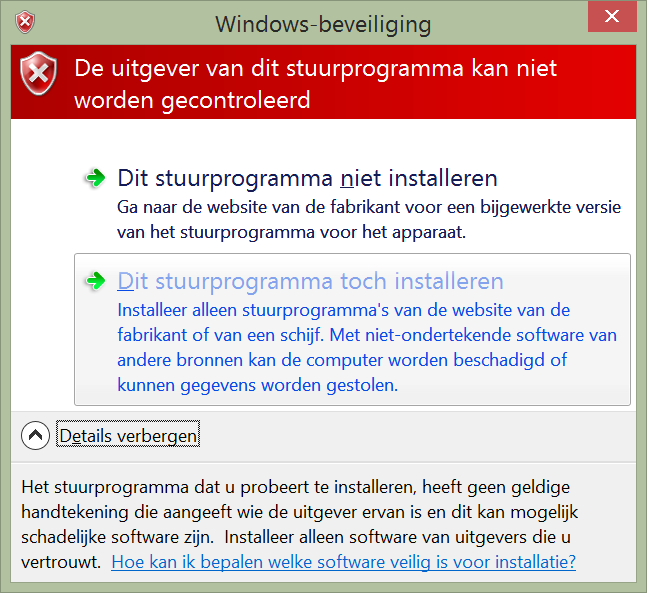 If you have warnings during installation press ‘Dit stuurprogramma toch installeren’. This means you need to install the drivers anyway. Reboot your Imac once finished installing BT device drivers. 2.2 Connect mouse and keyboard. 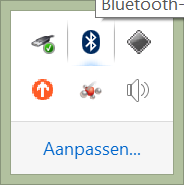 Once rebooted to Windows 8 go to the right corner and press the Bluetooth icon. 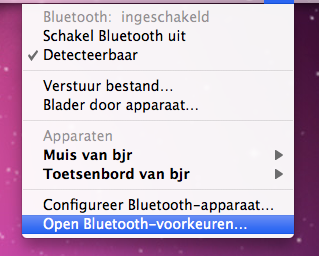 Select ‘Een Bluetooth-apparaat toevoegen’, the first option from above. 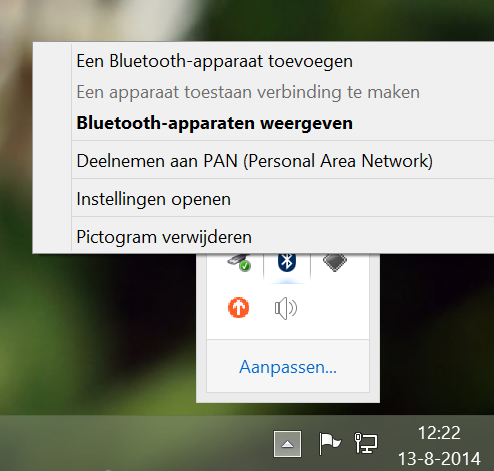 Windows 8 Bluetooth device manager opens. Be sure to have your mouse and keyboard detectable. Mouse: use the switch to turn off and on. Keyboard: press on button once on the right side. I should start blinking. In order to connect your keyboard you need to enter a code and press Enter key afterwards on your wireless keyboard. Windows 8 will show you a code once you connect your keyboard. Bootcamp into Mac OS X. Add the mouse and keyboard exactly the opposite way as described in step 1.2 and 1.3. – Once mouse and keyboard in Mac OS X removed, the keyboard is no longer responding to inputs at startup. Use a wired keyboard if needed. – In order to make a Bootcamp selection between OS X or Windows you need to press the Alt key at startup from a wired keyboard. – Reset your Apple Wireless Keyboard: Press and hold on/off button until green light turns off. – Starting Bootcamp when rebooting from Windows 8 doesn’t seem to work for me. I needed to turn off Windows and start again with Alt key pressed in order to enter Bootcamp menu. Sometimes it works, sometimes it won’t. Best is to use a wired keyboard I suggest. 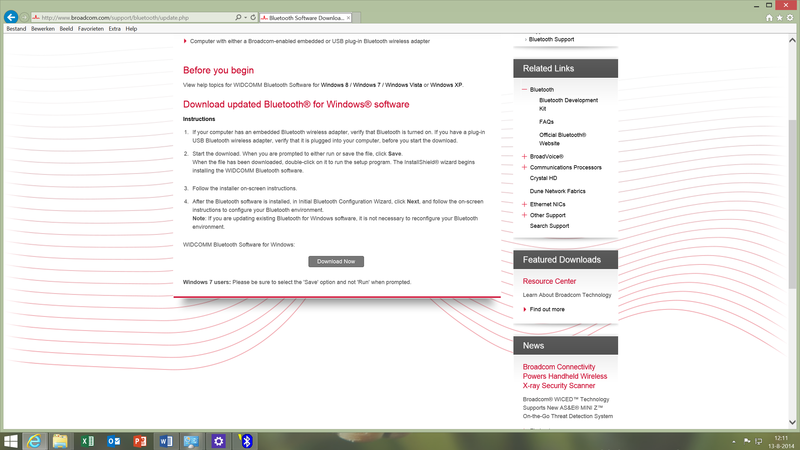 – Broadcom comes with a popup when starting Windows 8. © 2014 Datamirage. All content provided on this blog is for informational purposes only. The owner of this blog makes no representations as to the accuracy or completeness of any information on this site or found by following any link on this site. The owner of Datamirage will not be liable for any errors or omissions in this information nor for the availability of this information. The owner will not be liable for any losses, injuries, or damages from the display or use of this information.